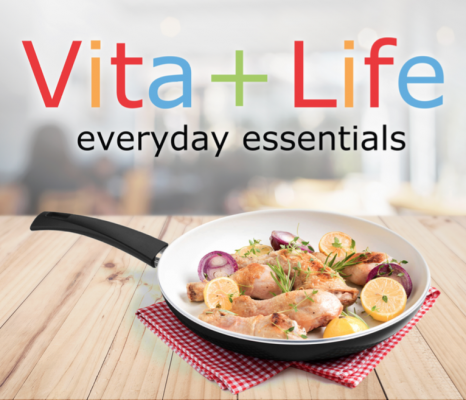 This durable cookware is produced with a heavy gauge aluminum combined with a thick ceramic interior and steel base. The construction of this high quality cookware provides even heat distribution, efficient cooking and long lasting usage. This stunning new range of cookware is suitable for use on the following heat sources gas, ceramic, halogen, electric and induction. The ceramic interior of these pans promotes healthy cooking by lessening the need to cook with fats and oils. The cookware also delivers a superior non-stick coating making it excellent for the use of frying and sautéing. 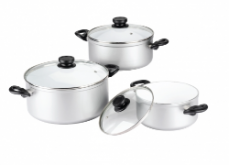 Save a FURTHER $100 off when you purchase a 3pce pot set in conjunction with a 3pce pan set.6 piece set RRP $549 all for $299 only at Perth Home Show! Buy a 3pce set of Vita+Life Pans at the Perth Home Show and receive $100 off the website price!